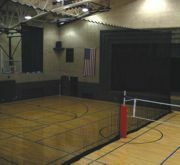 Carron gym divider curtains and court divider nets are built for durability and value with a variety of constructions available. Carron's curtains help create opportunities for several sports in the same gym at the same time. Carron specializes in designing netting or mesh-and-vinyl divider systems to suit nearly any floor configuration or need. And with a full line of high-quality sports nets and accessories, Carron is your one-stop net source. IPI by Bison's Gym Divider Curtains are an attractive and affordable way to maximize use of your gymnasium or multipurpose space. Curtains are available in fold-up, top-roll, roll-up and walk-draw styles, plus mesh practice cage designs. Facilities may select from several colors of 18 or 22-ounce anti-bacterial, fungi-resistant, flame-retardant polyester reinforced solid vinyl fabric and four colors of mesh with a 50 percent-plus open grid weave for air circulation. CoverSports has expanded the GymGuard gym floor cover product line to include GymGuard Plus, featuring a unique raised pattern that provides enhanced slip resistance while costing no more than the standard GymGuard line. Plus also offers an advanced level of safety and durability for ultimate gym floor protection. GymGuard Plus is available in 32-ounce and 27-ouce weights and Gray and Tan colors. Complementing the GymGuard line is CoverSports' Nissen EnviroSafe Wall Padding, custom-made to meet specific needs and able to be imprinted with school logo and other graphics. Join the thousands of youth camps, YMCAs, YWCAs, elementary schools, church recreation centers, basketball camps and city recreation facilities that use Easy-Up Youth Mini Goals. These goals are perfect for teaching aspiring young basketball players proper shooting techniques. Easy-Up converts any equipment with official 10-foot goal height to six height increments, ranging from 9 feet to 6.5 feet. One person can easily attach the lightweight Easy-Up in minutes without tools, and no assembly is required. High on University of Alaska's wish list for its new 5,000-seat, multi-use Alaska Airlines Center was a Covermaster protective gym floor cover system. Working with contractors and architect's specs, Covermaster technicians determined the best configuration for this world-class facility would be Covermaster's Ultima 4000 Series™ covers and companion handling/storage racks. Already used with great success, the center attracted performances by singer Tim McGraw, the Harlem Globetrotters and others, much to the delight of management happy they stuck to their wishes. PB Extreme Soft Toss Medicine Balls have a soft outer shell, which makes them easy to catch, throw and slam. Each ball is 14 inches in diameter, which allows for consistent exercise movement at all intensities. These PB Extreme Soft Toss Medicine Balls are only available through Perform Better. Request your free catalog by calling or visiting the website. 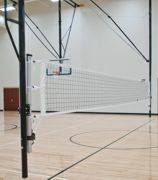 Draper's Overhead Volleyball System allows rapid setup for volleyball games. The OVS stores at the ceiling, with net, antennas, boundary markers and pads attached. The OVS overhead superstructure attaches to the roof structure with the same high-strength tube and clamps used on the EZ-Fold backstops for a rigid design. Bison Inc. is your source for portable basketball systems for all ages and every level of play. The T-Rex, Max and Club Court portables have models for physical education classes and multipurpose recreational facilities. 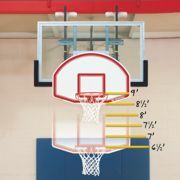 Competition systems with official glass backboards and breakaway goals are also available. One-person setup, simple height adjustment, safety padding and easy-to-transport designs are all standard features.